Thomas & Friends appeared in a series of children's books in the 1940s, and have delighted children and adults alike ever since. In 1984 Thomas & Friends appeared for the first time on British television and made an immediate hit - becoming without argument an even greater favourite with the younger fan. The Hornby range includes many of Thomas' friends. This year there are new buildings to choose from, all of which add colour and excitement to the Hornby World of Thomas, and a range of new locomotives, coaches and wagons. Hornby Thomas the Tank Engine Train Set. Recreate your own Thomas the Tank Engine� adventures with the Hornby range of 00 gauge Thomas & Friends� engines, carriages and train sets including all of your favourite characters from the iconic TV series. Thomas the Tank Engine 0-6-0, Annie and Clarabel Coaches, 3rd Radius Starter Oval, Train Controller (R8250), Wall Plug Transformer (P9000W), Power Connecting Clip (R602), Thomas and Friends�. 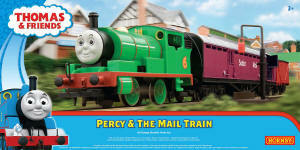 Hornby Percy And The Mail Train Set. Mail Coach can both pick up and drop of mail. Recreate your own Thomas the Tank Engine� adventures with the Hornby range of 00 gauge Thomas & Friends� engines, carriages and train sets including all of your favourite characters from the iconic TV series. 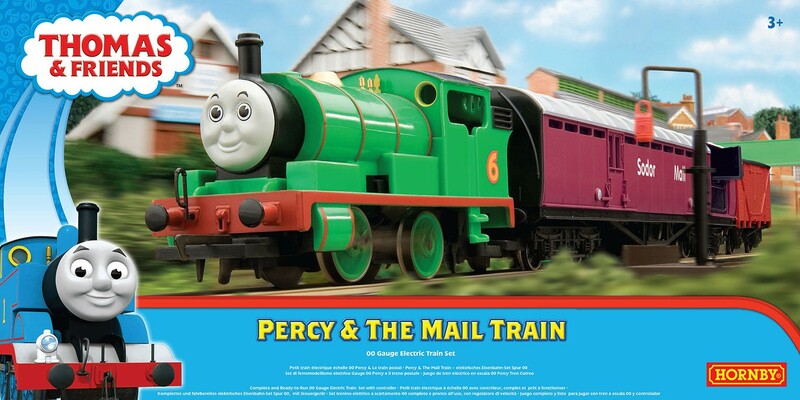 Percy the Saddle Engine 0-4-0, Sodor Mail Operating Coach Set, Red Oxide Vent Van, 3rd Radius Starter Oval with Track Pack A (with one point and a buffer stop), Train Controller (R8250), Wall Plug Transformer (P9000W), Power Connecting Clip (R602), Thomas and Friends�. Hornby Thomas Passenger and Goods Train Set. Recreate your own Thomas the Tank Engine� adventures with the Hornby range of 00 gauge Thomas & Friends� engines, carriages and train sets including all of your favourite characters from the iconic TV series. Thomas the Tank Engine, Annie and Clarabel Coaches, and two troublesome trucks, Starter Oval with Track Pack A (with one point and a buffer stop), Train Controller (R8250), Wall Plug Transformer (P9000W), Power Connecting Clip (R602), Thomas and Friends�. Thomas the Tank Engine, click here for service sheet. Annie and Clarabel as well as any Thomas wagons. Hornby Edward Locomotive. 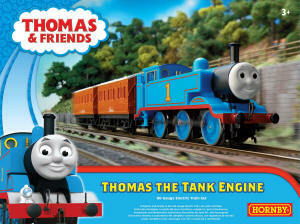 Part of the Thomas the tank engine & friends range. Wheel Configuration: 0-6-0, DCC Ready. Any Thomas wagons or coaches. Troublesome Trucks as well as any Thomas wagons. Hornby Annie and Clarabel coaches.